This weekend I decided to play a real life game of Pacman. and 100 points for eating a human. this just made my day. you are so creative! too cute! 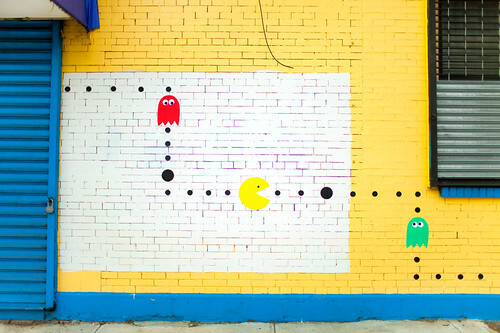 i wish i could play pacman in real life! You blog makes me happy. Oh Katie, you always make me smile! I love the last caption... "Run human, run!" so clever. i love it!!!! So cute! You are so creative Katie! Love it! I wanna play! i wish i lived in nyc to see all of your fun creations every where! Oh my monkeys would love this- They are so into pac man and we have the old skool version (i like to keep it real). They would love this all over their rooms! gorgeous and adorable - as always! I love your sense of humor, and this post/blog! So refreshing! Your ideas never cease to amaze me! I wish I was as creative as you! LOL -- you are just too much! 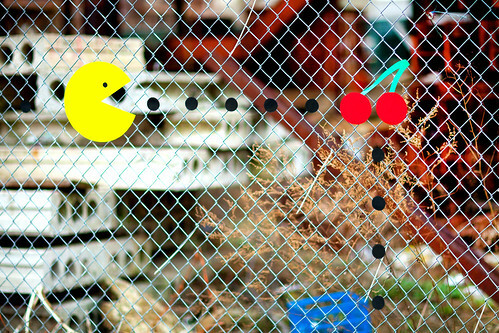 is it a coincidence that yesterday i put a new pacman widget on my blog, and today you posted these cute pacman project of yours! Ah. Pacman. It's great to see it take over real life too! 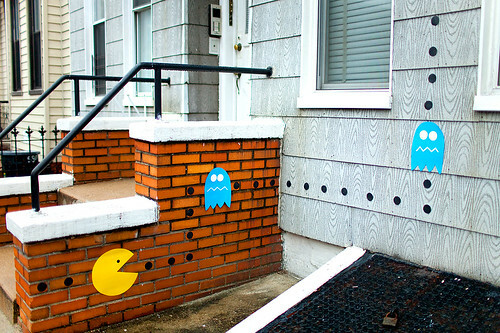 i can hear the pacman music running through my head right now! So creative...how did ppl react on the street? This must've taken you ages, it's SO cool. I wish I was this creative! Wuau!This is so original, we love it!! Awesome! Hey, does anybody ever ask you what you're doing or tell you to stop or something while you put this kind of street art up? This is amazing. So fun! This is the greatest. I love your creativity. Thanks so much everyone! To answer your questions-I only put my paper pieces up on abandoned buildings or empty warehouses (there's tons in brooklyn!). I've always been so bad for packman, like really bad. But maybe I'm best for this packman. your blog always knows how to lighten up my day and put a smile on my face! thank you! You made my day! 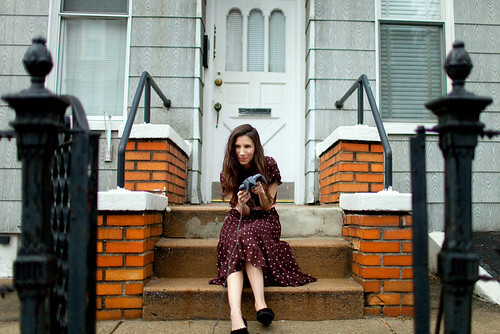 Another reason fpr loving your blog! you always brighten up my day, i love all your ideas! I love this! Especially when it wraps from the porch to the wall. So how many points did you get? SO cool. You're the coolest person I've ever e-met! @Lulu - I use this paper! Tee hee--I think this looks like an awesome project to do with my students this spring! Thanks for the inspiration! We will definitely be re-creating this on our playground and taking art outside! You rock! Funny stuff. I think you have an awesome mind. I wish I lived in your neighbourhood! I wish i could play! you definitely have a way of bringing things to life katie! Your posts make me so happy, but what happens to the paper afterwards ? I hope they are discarded with care and aren't left there to be washed down by the rain.. I'm a bit of a gamer so this one hit home! Love it! I also am going to school to be an art teacher; your post make my heart burst with excitment! @ Amy- I always take my pieces down. I would never leave something out to rot away! My uncle used to repair video games and we loved it when he had PacMan in his shop. We used to play that and pinball for hours. Thanks for bringing back some good memories! That is so creative, clever, beautiful and HAPPY! I love it. Katie! This is awesome!!! But how do you post all your brilliant artwork in public spaces without getting in trouble/fined? Well it's just paper and tape. I'm not damaging any property and I always remove the pieces later that day so they don't fall down and turn to trash. unbelievably cute (and funny)! also, just wanted you to know that you're my inspiration for not having boring captions on my pictures -- you make everything fun! chanced on ur blog and i love it. will bookmark it and visit often. check mine too in case u have time: http://destinednomad.blogspot.com/ it's more on life travels but urs is awesome! So you love to play pacman? Pacman Love - this takes me back Ha Ha!! Great! You are the one of the coolest people I (don't) know! Seriously. I just want to live in your head for A DAY. ONE DAY of pure bliss. this is so amazing ! you've got such great ideas ! hey! i think i'm comment 100. which means i will have nothing original to say. still, loved this post so i had to say something. whee! Sooo Cute! I love you Katie! You are amazing! I just discover you...I really really love your art. You are so creative and inspirational! Love it!! i really looove your imagination and creativity! Me favorite part is the subtle inclusion of the N64 controller cord goin out o'the screen in the first pic an ye see a wire-like cord in the top o'the second pic. Hi Katie i found your blog a few hours ago and just now i finish it from beginning to end, you are such a joy i wish i had a friend like you to put a smile on my face you are adorable, love your spirit! 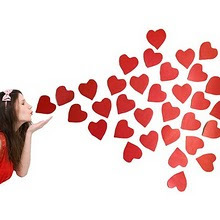 Thanks for being a beautiful blogger! 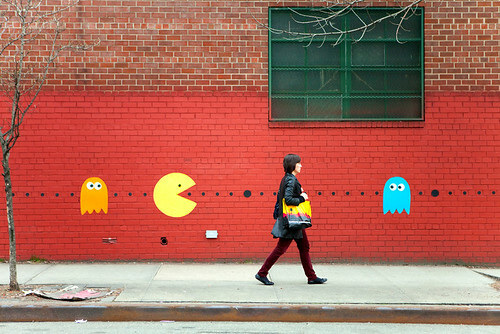 Love your work and I hope your pacman managed to eat that human! that is hilarious. what fun you must have had watching people's reactions. You are artist of day in Serbia. I am always astonished how creative you are! Amazing job! HAR!!!! this is so cute! and hilarious! here via Quiet Like Horses. so creative. love it! and the improv everywhere...LOVED it. run, run! oooo, love your Pacman Katie! Gosh, the real 80is feeling is coming back to me. sometimes i wonder what it'd be like to have a brain that could create SOME sort of something..but then i just come to your blog & that wonder is all taken care of! i really really love that! Packman was allways too difficult, too fast for me - never played computer games. But your photoshoot is so great, so cute! That's SO cool! You are the most creative person I've ever "met" :p! I wish I could stick all kinds of colorful stuff around my neighborhood but I'm only a 14-year old shy girl :/ oh well. Someday I'll take some friends and bring back some color here :D.
Ha! Love this. Pacman was always my favorite arcade game when I was a kid. wow! I've always wanted to know what it would be like, living in a video game - dreams come true! I love your creativity and limitless ideas, and your cat is just adorable! i would get such a giggle if i ever walked by one of your creations! Hahaha, wow! You are so clever. I love it! Wow...What a wonderful game. I like it very much. You described very clearly about this game. In this game, First I will target for human. That's SO cool! You are the most creative person I've ever "met" :p! I wish I could stick all kinds of colorful stuff around my neighborhood.